Join the discussion on our forums! Come discuss Mossy Horror over in our dedicated Mossy Horror discussion topic. Time to gobble up some spirits. Good artwork, good design. Wow. Keep in mind that Mossy Horror is invaluable vs. all Druid's and Spreading Plague as an entire board clear for 6 mana. (BETTER than Blizzard and Flamestrike in that spot!) Giggling Inventor and on the flip side, the lesser statted DR minions in the Boomsday expansion are a big part of what made/makes this card a worthy tech choice in today's meta. Remember, this is a Witchwood card and was not adopted into the same said meta. Its playability prior to this newest expansion was nil. (Similar to the current meta in favoring Blood Knight. Another direct counter vs. Giggling Inventor, yet again.) 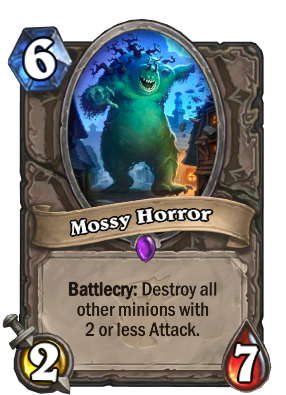 Remember, that the very best Mossy Horror plays are those that both clear your opponents' board AND trigger your deathrattle minions on YOUR own side for an even better board state whether played by your opponent or by yourself, depending on the particular matchup and board state. IE. DR Egg decks benefit greatly! Think about Spider Bomb in DR Egg Hunter, and Blightnozzle Crawler and Mechanical Whelp in DR Rogue. Some serious tempo swings are sure to follow. I think it's safe to say that as long as there continue to be a plethora of decklist choices, Spreading Plagues, Giggling Inventors, and Deathrattle decks, Mossy ain't going nowhere yet...Enjoy! In a meta where more than half of all decks run Giggling Inventor, this guy is a surprise MVP. That's what matters :) I'm hunter guy. Gonna call it right now. Best card of the expansion! By turn 6 those 2 attack minions will be buffed and have either +1 dmg or +2 dmg. Although i think this is useful vs. Knife Juggler Paladin decks. Were they so afraid that Hand Druid with Wisp and Treant would actually be a thing that they already put in a counter??? They weren't wrong! one year later! Obvious hate for paladin is Obvious. This might be a good “one of” in midrange decks playing against control warlocks. It helps you to clear out the three Voidwalkers from a Voidlord. Like Shadow Word horror (4 mana) with a 2 mana 2/6 body attached to it. That's value laden, plus that's baseline not even considering combos. Might be good in priest or paladin control because they can reduce attack with cards like Aldor Peacekeeper and Twilight Acolyte.